Our library has an extensive collection of fiction books in addition to materials for research. We also have a very healthy graphic novel collection and the “Actors’ Bookshelf” and Judy Mayeux special collections. 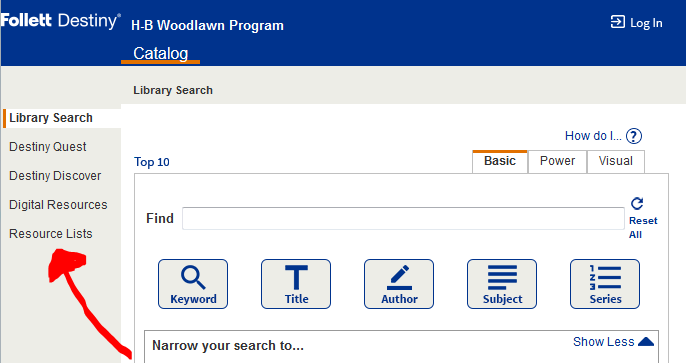 Students can access one of H-B’s databases called “NoveList” by using access.apsva.us and then “MackinVia.” NoveList is a database housing book information that is searchable by lexile (aka, reading level), by genre, by topic of interest, etc. With this database, students can look up books they love, and then find books that “read alike.” Ask Maggie if you want help getting oriented to the database. Capitol Choices – Recommended book lists from librarians, teachers, booksellers, children’s literature specialists, reviewers, and magazine editors who work in cities, suburbs, and rural areas in and around Washington, D.C.
New York Public Library Site: Stuff for the Teen Age. Check it out! Don’t you hate it when there is a huge gap in a series? Check out this site: Recaptains: Saving Series, One Book at a Time, designed to refresh your memory between that “last” book, published years ago and that “newest” book. And don’t forget to check out our TAB page and the Public Library Teen site, TATAL Online, with top titles chosen by teen readers. What has our Supervisor of Libraries been reading? Check out former H-B Librarian Theresa Flynn’s Wild Librarian Bookspot — hundreds of reviews and still counting. Purchase priorities change each year, but we always include the recommendations of students and staff, and these often take priority in ordering. Want to help us build the collection? See our wishlist at Amazon.com for titles we would like to include. Thanks!